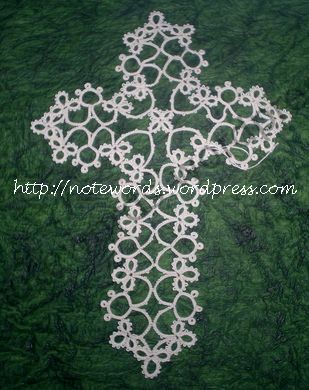 This entry was posted in Challenges, Christmas, Crochet, Crochet, Handwork, Health, Knitting, Shuttle Tatting, Tatting, Tatting and tagged challenges, Christmas, handwork, health, knitting, lacemaking, Life, shuttle tatting, tatting. Bookmark the permalink. Many blessings and well wishes to you and your husband this holiday day season. Thank you. Best wishes to you and yours. It was a difficult year but it is important not to lose Hope! Thanks. All the best to you and yours over the holiday season. I had my own health issues this year including cancer, so I can empathize. Didn’t get my car stolen, though (touch wood!) The important thing is we made it through.and are able to tell the tale. Joy and happiness are where you find them. Hope you find an abundance of them in the coming year. Much appreciated. Best wishes to you and yours for the new year. Strength and blessings with your own health issues. Hope all goes well at the appointment whichever day it turns out to be. Hope you both have a better 2019. Thanks. All the best to you for the new year as well. That’s a difficult time indeed. I’m sorry you’re going through all of that. Hopefully things turn for the better soon! Fingers crossed for the appointment! Terrific news!! I’m sure the follow-up visit will go well too. Best wishes to you too, may you find plenty of blessings in the days ahead! Continuing to send good wishes for you and your husband for things to get better and for his health to improve! Onward and Upward, my lovelies! The only way! 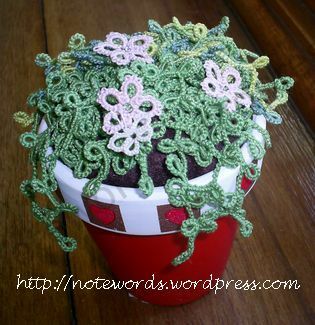 Adore the tatting and plant. I can certainly say I hear you re travel and time of year and folk not being around and a sense of ‘weight’ involved in it all as I went in again on Wednesday (ambulance and everything), came out again last night 🙂 Lots of fun and games ain’t it? But it’s all OK, it really is, whatever the outcomes, or that’s what I’m telling it at the moment. We’re able to communicate and love and share – good enough for the moment? Sorry to hear you’ve been in hospital again. If you want to flirt with all the handsome doctors… 😉 Only joking. Forward is the only way. The plant is amazing. Incredible detail. I wonder if my mother has seen these, will have to ask. Along with my happy busy I’ve had some rotten busy as well. Makes peaceful days at home even more pleasurable for me. I wish you both a very merry Christmas and all the best for 2019! We will get through it. 😉 Thanks for coming past! Have a wonderful Christmas and all the best to you and your family for 2019.